If you click on the link you won't find much of a website - this is because Mineshaft does its thing the old fashioned way - on paper! 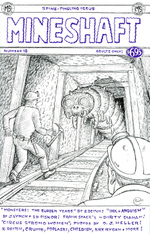 Do yourself a favor, get off the internet and get Mineshaft! Hello Benjamen, Thank you for all the nice comments about Mineshaft. We appreciate it! When you posted your comments on the 9th our stat counter on the website shot up double our record high and Everett searched around the web to see where it may be coming from and he traced it to you. Your good words have encouraged many people to subscribe and purchase the latest issue! Many thanks again and I'm glad you enjoy Mineshaft.